In a mixing bowl, combine the apples, cranberries, brown sugar, ginger, cinnamon, nutmeg, lemon juice and salt. Roll out the pie dough and cut out four rounds that are slightly larger than the mouth of the baking dishes. Fill the dishes with the apple mixture. Top each ramekin with a round of pie dough and crimp the edges with the tines of a fork. Brush the crust with the egg wash. Transfer the baking dishes to a baking sheet. Bake until the crust is golden brown and the apples are tender, about 20-30 minutes. Serve warm or at room temperature plain or topped with vanilla ice cream or whipped cream. At Yum-o!, we believe in all things in moderation. Special treats like these Apple Pot Pies are to be eaten once in a while and only after you’ve been a good eater the rest of the time. That’s why it’s called a treat! In Recipes-list.com we have selected the most viewed recipes from category - uncategorized . Enjoy the best recipes specially selected for you! 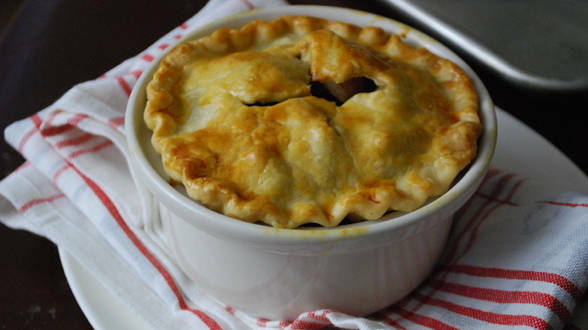 Apple Pot Pies is the right choice that will satisfy all your claims.